Hotel muy centrico, ubicado al lado de caldea. Estancia perfecta. 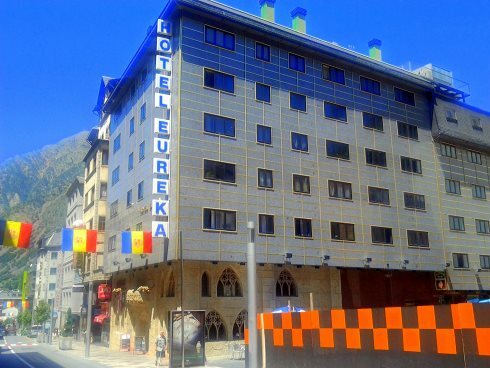 This appealing hotel is ideally located in the centre of Escalde. Links to the public transport network are situated nearby, offering ease of access to other areas to be explored. Guests will find themselves within easy walking distance of many shopping opportunities, restaurants, bars and pubs. The nearest nightclub is just 900 metres away. Energetic travellers will enjoy close proximity to the ski area, which is just 12 km away. This charming hotel appeals to every type of traveller. The guest rooms come complete with modern amenities. The hotel features a buffet-style restaurant, where delightful dishes are served. Type: Hotel, Hotels With Charm, Ski Hotels. ** There is building work scheduled on the hotel surroundings. Services: Breakfast buffet, Buffet lunch, À la carte lunch, Buffet dinner, À la carte dinner. Hairdryer, Satellite TV, Minibar, Central heating, Safe.